Tsutakawa Fountain, SCCC. Photograph by Alia Marsha. Yesterday (5-16-2013), the Associated Student Council (ASC), the Capital Funds Review Committee (CFRC), and many SCCC students met in the Student Leadership building to discuss the CFRC’s decision that denied a funding request of $8,000 made by Seattle Central’s Fountain Committee. 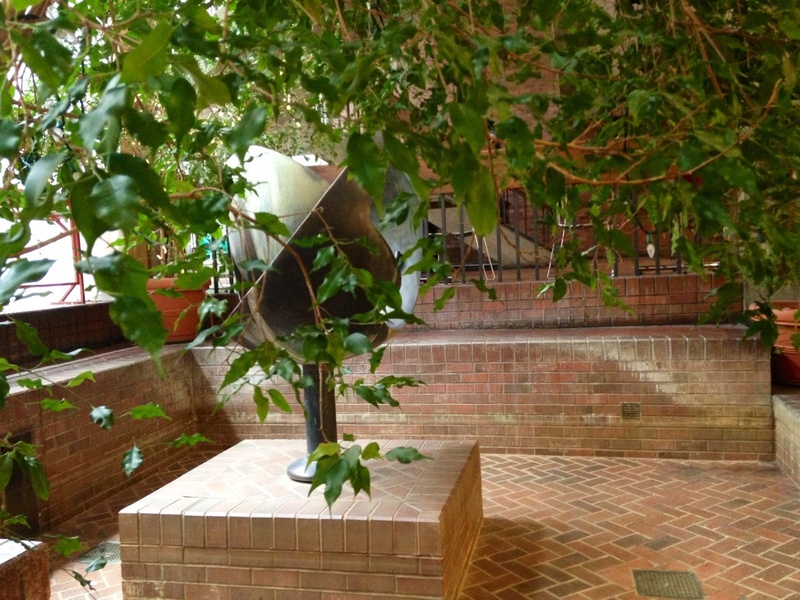 This money would go towards restoring the cultural icon that is the Tsutakawa fountain in the school’s Atrium, donated to SCCC by Seattle’s own George Tsutakawa, a Japanese-American artist, painter, and world renowned sculptor who attended the campuses former Broadway High School. Students present at the meeting felt that this letter put out by the CFRC makes sweeping assumptions about the interests of the student body without personally addressing them directly. Many also thought the letter discredited the views of each and every student who signed the petition in support of distributing the additional $8,000 in funds from the Student & Activities budget. Subsequently, we were disappointed when we witnessed certain board members who seemed lost in clipboards, number crunching, and policy enactment that they couldn’t see how this unifying project would directly affect student experience. The mobilization, reflection, and the inspiration this project would bring to our campus is beyond compare. “There are other projects on campus that we feel more directly affects students’ experiences here on campus,” affirmed Leah Remsen, CFRC Chair. Students who attended the meeting in support of the fountain first sat through a 30 minute presentation titled the Furniture Project by Jameel Bhojani, a member of the Student Facilities Committee as well as the CFRC. This project originally was allocated $250,000 from S&A budget but ultimately will spend $127,991 on new furniture for the Broadway Edison Building, leaving an excess of $122,000 to sit on reserve for future furniture upgrades. Understandably, this left a sour taste with the students who showed up to support the request of $8,000 from S&A budget, which would be enough to complete the first phase in the fountain’s restoration. The students were expecting to share why they support the funding proposal for the fountain in the meeting, but none of them could have predicted the high level of power hungry, bureaucratic absurdity that took place throughout the very heated discussion. At the same time, members of the ASC and CFRC did not expect such a large attendance of students at the meeting, whose knowledge of the particular issue at hand seemed to vary. Those 700 student signatures obtained in March were the result of the ASC’s request for proof that there was student interest in the fountain. To oblige, the Fountain Committee reached out not only to students, but to the Asian-American community right here in Seattle. During a discussion at an ASC meeting last month, a stack of letters was delivered voicing support from the Wing Luke Museum, the Seattle Asian Art Museum, local business Uwajimaya, and the Tsutakawa family themselves as evidence of overwhelming support for the fountain. Somehow, this was interpreted by the CFRC as justification to not give financial support. This implies that the Fountain Committee should be reaching out to these supportive individuals and establishments for money instead of the S&A budget here at SCCC. While S&A budget has distributed just under a thousand dollars to the fountain committee, many students and faculty feel that this is not enough of an effort on behalf of the college as an institution. “There’s the idea that the school shouldn’t have to pay to help to take care of [the fountain], replied Najwa. “Why don’t we just ask Mr. Uwajimaya to pay for the fountain?” she asked in a sardonic tone. “Why don’t we just ask him to fix the bathroom while we’re at it?” Her remarks were followed by applause and cheers from the guest students sitting in on the meeting. Overall, the original message of the Tsutakawa fountain seems to have gotten lost in translation amongst the ASC and its adviser. Feeling overwhelmed from the meeting, we went to speak with Tina Young, SCCC’s Multicultural Services Director and Fountain Committee Co-Chair. She was able to put things into perspective by reminding us that what we fight for is something beautiful – something that connects us with the past in order to make sense of the present. Both the ASC and CFRC members repeated again and again how thankful they were that students came to voice their opinions at yesterday’s meeting. The ASC Executives will meet again next Thursday at 2pm in the Student Leadership building to vote on whether or not they will approve the Fountain Committee’s proposal request of $8,000. Even if the seven voting members decide to vote against the 700+ student voices, the Fountain Committee remains hopeful about the future of its fundraising efforts.